Keeping your cat happy and healthy is fairly straightforward with regular check-ups, a good diet and exercise. Unfortunately a simple oversight could lead to tragedy. A sad example is the sudden death of one of our patients, a completely indoor cat. The recent necropsy performed in our hospital revealed heartworm disease. Stop that Mosquito! It would be great if mosquitoes could be stopped from transmitting heartworm disease. While indoor cats aren’t as exposed as outdoor cats are, a bite isn’t out of the realm of possibilities. Many owners of indoor cats believe they don’t need prevention for heartworms,, but when the disease goes undetected for months, the result can be adult-sized (14-inch) heartworms thriving inside a cat’s small heart and arteries. An undetected case of heartworms isn’t that far-fetched for cats because the symptoms are easily mistaken for other problems. For instance, the most common symptom, breathing difficulty, is often presumed to indicate asthma or pneumonia. Prevention is always better than treatment. Treatment may kill the heartworms, but dead worms inside your cat’s heart and arteries are as problematic as live ones. For our feline patients, we recommend Revolution, a once-a-month topical treatment. Applied topically to the skin between your cat’s shoulder blades, Revolution also prevents most intestinal parasites, ear mites, fleas and ticks. Meat Me Beside the Freezer at 5 p.m. Cats and teenage boys have a lot in common: they’re not predictable, and they love meat. If you’re not familiar with Nature’s Variety Instinct Raw Frozen Diets, you and your cat are in for a treat. Instinct patties, medallions or chubs have been flash-frozen for optimal quality and nutrition. They offer what nature intended and give your cat the nutrition he’ll adore. Want to learn more about RAW? Click here. Many pet owners see a true turn-around in their pet’s health when they change to Instinct. For their testimonials, click here. 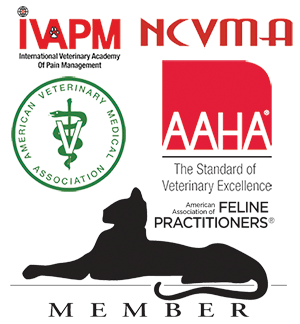 We’d be happy to discuss your pet’s individual health needs with you. Give us a call to ask questions or set up an appointment for an initial assessment for your pet. We would love to hear from you. Changing Fate. How to Stop The Five Common Cat Ailments. a) Born to be Raw. If you don’t know about the benefit of feeding Raw to your pet, click here for more information. Keep in mind that cats are carnivores and crave meat. b) Routine clean. Schedule a routine teeth cleaning for your cat at Town N Country. c) In-between cleanings. If you start at the kitten stage, tooth brushing can be a good habit. We recommend Oravet toothpaste and toothbrushes for the job. An alternative to brushing is CET (Clean Every Tooth!) chews. 2. Feline Oral Resorptive Lesions. Follow the preceding steps for good dental health for your cat. In the end stages of this dental disease, the only treatment would be extraction. 3. Obesity. Prevention is always a better route than treatment. Provide cat platforms or trees for exercise opportunities inside. 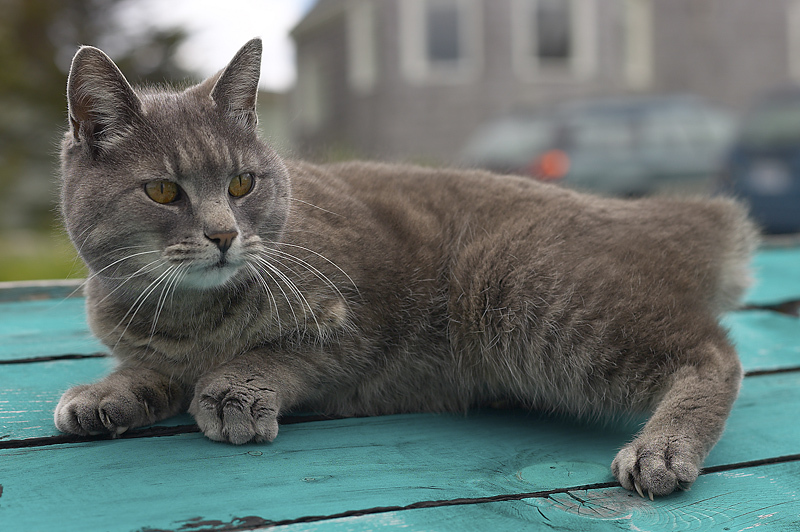 For some cats, time spent outdoors is just what’s needed to keep them fit. (Click here for more ideas.) If your cat is starting to resemble Garfield, think portion control. Measure as necessary! 5. Hairballs. First of all, a hairball is not a normal cat activity like scratching or stretching or playing with your shoe strings. In mild cases of this digestive malady, Laxatone may alleviate the symptoms. We may recommend a specific diet to overcome hairballs. Your cat’s good health doesn’t have to be complicated. By taking time for a few simple habits and working with your vet, you can do your best to assure an active, healthy life for your pet. If you have any questions about your cat’s symptoms or a personalized treatment plan, give us a call. We love to hear from you. As a cat lover, you know how independent cats are. Inside or outside? In your lap or on top of the piano? Excuse me, is that a book in your hand and were you planning on reading it? Chances are your kitty thinks the reason you opened your book was so she could sit with you and paw the pages. Watch out! He may think the reason you’re on the computer is for his entertainment purposes. 1. Periodontal disease. Approximately 80% of cats suffer from some form of periodontal disease. Tartar builds up, and bacteria accumulated under the gum line is continually flushed into the pet’s system, leading to heart, kidney and liver issues. 2. Feline Oral Resorptive Lesions. As painful as it sounds, these lesions start at the root of the tooth and work outward to the enamel, making small holes. In the early stages, you won’t see any physical evidence when you look in your cat’s mouth, but his mouth may be very sensitive. She may even stop eating when the symptoms intensify. 3. Obesity. 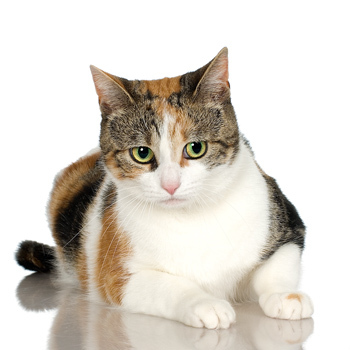 54 million cats are overweight; that’s about half of our cat population! Obese cats don’t live as long as healthy cats and are more likely to develop arthritis, high blood pressure and many forms of cancer. Click here for ideas to keep your kitty fit and fabulous. 5. Hairballs. Cats are created to groom themselves, digest hair and eliminate it without issue. Hairballs are not normal, and they may signal disease or another temporary gastrointestinal problems. Ongoing vomiting or gagging without producing a hairball, reduced appetite, lethargy or bowel problems may signal a problem with hairballs. Of course, we don’t want these predictions to come true! Next week, we’ll talk about learn what every cat lover should know about prevention and treatment for these five common problems. If you suspect any of these problems in your cat, give us a call! We predict that you’ll be glad you did! Image courtesy of Pet Insurance and More.